In 1941, Boston Red Sox’ Ted Williams went into the final day of baseball’s regular season batting exactly .400. While he could’ve sat out – Boston was 17 games back of the first place Yankees, Williams understood batting .400 wouldn’t mean as much if put himself before the team. Williams went a combined 6-8 in the doubleheader (Game 1 Game 2) – on his way to the .406 batting average we haven’t seen since. According to this story on ESPN.com, Bryant will sit out in the final game of the season against the Sacramento Kings tonight, forfeiting a chance to take home his third career scoring title. He needed 38 points to beat out Oklahoma City’s Kevin Durant, who played their final game of the regular season last night. Kobe had the chance to smack ESPN in the face tonight. By scoring 38, he makes an argument he’s the best player in the NBA, not the seventh best according to a preseason rank on NBA on ESPN. Remember, this comes in the same season he had to adjust to a coach not named Phil Jackson and a Scottie Pippen not named Derek Fisher. He has not let his basketball stardom fog his vision of another NBA title – basketball’s ultimate measuring stick. Yeah…Kobe is exactly right. We do know he can go out and score 38 at whim. He’s the only player in the league that can say that without a backlash of pseudo-news and debate on Twitter. Let me know in the comments if you disagree. LeBron could say it and be truthful, but we love hating LeBron too much to let a comment like that slide. 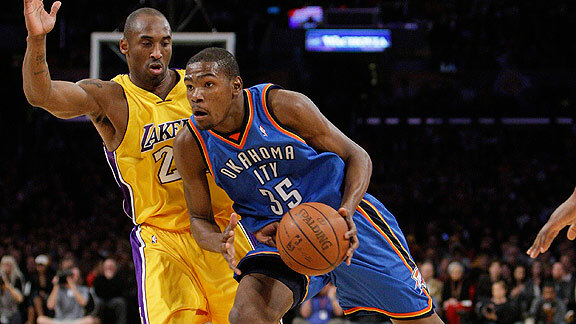 While Kobe could use father time to school the younger Durant, he didn’t. He showed class. He conveyed he’s not bigger than the game. It was refreshing, and I think it reminded basketball fans how special Kobe is. When we look back on Kobe’s career, there will be an unofficial asterisk next to Kobe’s amount of scoring titles. In a sports era where asterisks are associated with negativity, this asterisk will reiterate how special Kobe was. Remember when Jose Reyes voluntarily sat out of last season’s finale to ensure his batting title? Yes he won, but sports fans partner his batting title with, “Yes, but he sat out the last day of the season to ensure he would win,” communicating he put himself before the team. Rest up Kobe. A third scoring title doesn’t look as impressive as a sixth championship. The Lakers are a better team without Andrew Bynum. Their career 1-8 three-point shooting center has a lot of growing up to do. Subjectively, he sounds nonchalant and conveys a care-free persona. “I” wanted to take another one, so “I” did. Bynum indirectly admitted he is a selfish player at times (at best). Bynum knows he belongs nowhere near that three point line, yet consciously chucked it up anyway. **In my opinion, the Kobe and the Lakers are fed up with head coach Mike Brown. In his defense, replacing arguably the greatest coach in basketball history plus inheriting a veteran franchise is not an easy task. Still, Brown will catch a lot of heat. Bynum’s interview begs the question, “Coach, do you have control of the locker room (let alone Andrew Bynum)?” Mike D’Antoni didn’t. 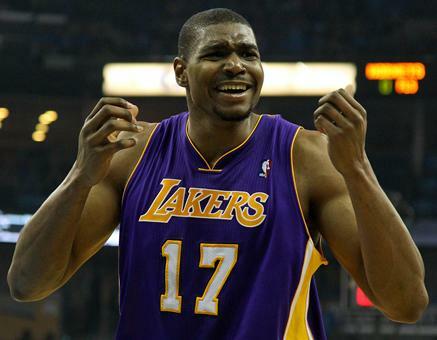 Do Bynum’s seven-foot frame and above average basketball skills eclipse the negative baggage his attitude elicits? Yes, the Lakers won two championships with him, but as he gains seniority, will Bynum’s pro/con baggage tilt in the opposite direction? I think within a year or two it will. What is his “negative attitude ceiling?” It doesn’t help he can’t stay healthy. The Lakers’ biggest win would have been to trade Bynum in a package deal for Orlando’s Dwight Howard, but that’s a rant for another day. “Intangibles” is the most underrated stat in sports. We drown ourselves in numbers, but give me a stat for locker room presence. Does this individual catalyze or retard the team’s progress? It’s the one stat the sports world is missing, but at least now I know where Bynum ranges in the category. LeBron James is the most athletic, talented, and arguably strongest pound-for-pound player in the league today. He has the gall to take, and hit, circus-clutch shots like this (skip to 2:54)…and this (skip to :45), yet under 24 seconds in the final period, he’s a consistent no-show. LeBron James is the “The fans’ pressure greatly affects me” poster-child. And we love it. We fans know we have the collective ability to greatly affect arguably the most powerful character in the NBA. That’s why it’s so much fun to hate LeBron James – because it works. *For the record, I do feel bad for LeBron. All he wants is to be loved… it’s just not working out for him. How you interpret this: I’m benefiting a charity. This is a great PR move. How the fans do: “My talents? !” ugh…and yes LeBron, you are the center of attention. I know that’s what you want. Thanks for making yourself bigger than the game. How you interpret this: I still love you guys. I’ll never forget where I came from! How the fans do: It’s like Benedict Arnold giving out free burgers & dogs on Independence Day. 10/11/11 – Tweeting to ESPN’s John Clayton asking when NFL teams can sign free agents. How you interpret this: The NBA is locked out, but I’m a football fan like the rest of ya! How the fans do: Why are you worrying about football?! Don’t you care the NBA canceled the first two weeks of the season yesterday? How you interpret this: I was loved in Cleveland, maybe THAT’S my key to being loved again. How we do: LeBron… ugh just don’t say anything. The interesting theme here is (I feel) LeBron truly thinks these aforementioned slip-ups would result in a more positive public image. However, LeBron has dug himself a PR hole so deep he can’t escape with a few pseudo-events or actions. To improve his image, he must at least play a major role in a Heat championship, and multiple times – a feat immensely difficult. I’ll talk about this more later. And why, LeBron, do you make your twitter handle @KingJames? It comes off as self-centered to the average fan – especially the ones who love hating you. On a random note, Derek Jeter, Kobe Bryant, Eli Manning, and Albert Pujols don’t really tweet. Do the winners naturally avoid twitter? 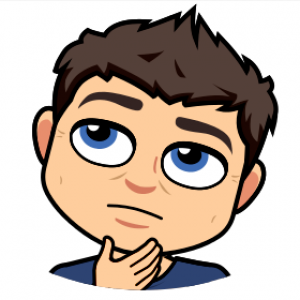 Do great ones recognize social media as a distraction? A concentration retarder? Let me know in the comments. Fans try to affect all superstars. The difference is the truly great ones either ignore or thrive off the hate. What happens when Kobe, Reggie, Jeter, Eli, Michael, and any other big time winners get hated on? 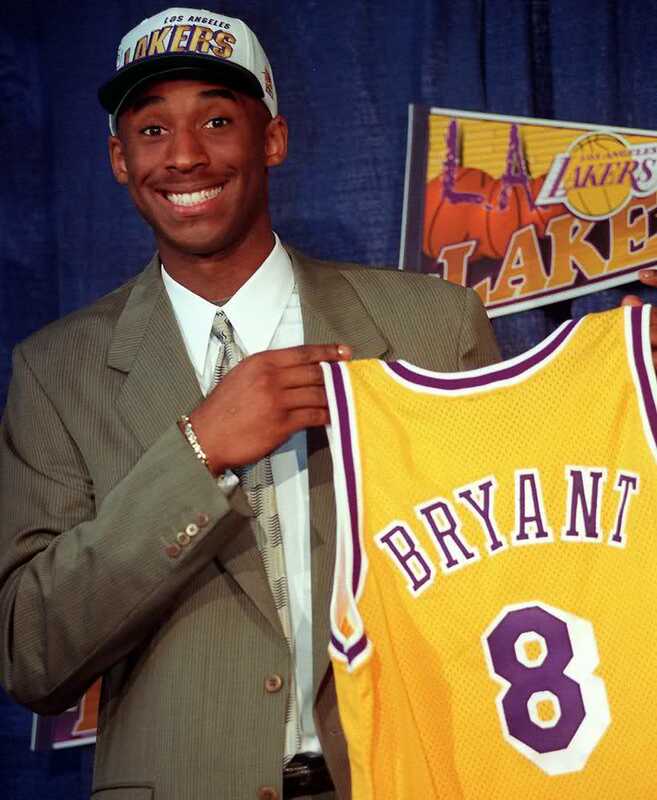 Kobe Bryant – He was blacklisted after his sexual assault case in 2003. Today, he’s arguably the closest player to Michael Jordan. Kobe claims he has had not rivals in his career, and I think he’s right. Reggie Miller – No championships, but if you don’t think there was a direct correlation between pressure and performance, watch ESPN’s documentary Winning Time: Reggie vs. The New York Knicks. Derek Jeter – Five-time World Series Champion in America’s biggest market. Non-Yankees fans have been trying to hate Jeter for 17 years, yet he continues to show he is unaffected. Eli Manning – The biggest reason why the Gotham Giants have won their two most recent Super Bowls. Okay, you can argue defense carried them in 2007, but not in 2011. LeBron has made some big mistakes in his NBA career – only some aforementioned, but his biggest mistake is one he has yet to overcome – not being himself. He wants to be Michael Jordan so badly. Choosing #23 for the first seven years of his career was LeBron’s inaugural mistake. It showed weakness. 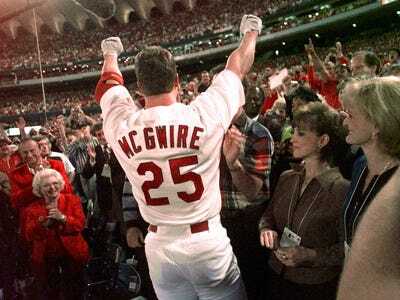 It immediately conveyed he wanted to follow in Michael’s footsteps, not pave his own legacy. Michael takes the final shot. He didn’t care what you thought. Reggie wanted Knicks fans to hate him – and what happened the last time he played at the Garden? 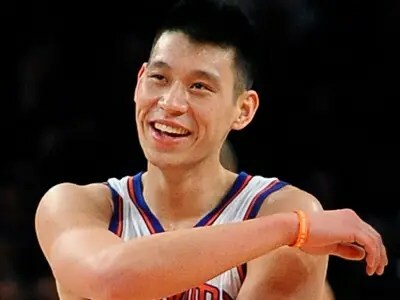 Knicks fans serenaded him with respect – chanting “Reggie! Reggie!” as he left the floor. Barring a crazy steroid scandal or anything unforeseen, Derek Jeter will be cheered in his final game at Fenway Park. I guarantee it. Fans aren’t dumb. We know who the star players are. Fans judge a player not just by physical ability, but reaction to immense pressure. LeBron has failed to show he can handle the latter. 1) Fail in Miami. Not on purpose, but if you win even one championship here then leave for Cleveland, it conveys, “Okay, I got one – I’m ready to help you guys now.” Because that’s a slap in the face. But right now, where’s the killer instinct LeBron? If you don’t have it… that’s okay. Honestly. If you can’t be Michael Jordan it doesn’t mean you’re a bad person nor are you a bad basketball player. If you win in Miami congratulations – that takes hard work. However, you will never be Michael if you win in Miami. You’ll never get back Cleveland’s respect, and you can keep your twitter handle @KingJames because it won’t mean anything. The King? I have a new one…Dwyane’s Prince.